This stunning species is native to East Africa from Ethiopia through Malawi, Kenya, Tanzania, Uganda and south to Zambia and Angola. It is found in highland forests (1500-2300m) in deep shade on tree trunks. 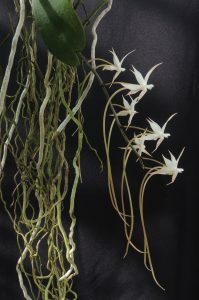 The plants are quite stout for Aerangis and this plant that we de-flasked in 2005 has taken thirteen years to reach its current size but now flowers regularly with multiple long elegant spikes. We find that Aerangis species are particularly easy from seed especially the potentially tricky de-flasking stage. 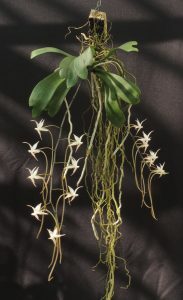 Fortunately, lots of the species are much quicker flowering from flask than Aerangis brachycarpa. This wonderful plant must be one you come and find in the greenhouses if you are at the show at the end of the week.